recommended for: Fans of everything Cat Winters (e.g. Steep and Thorny Way), Code Name Verity by Elizabeth Wein, and other intricate historical fiction with strong friendships. 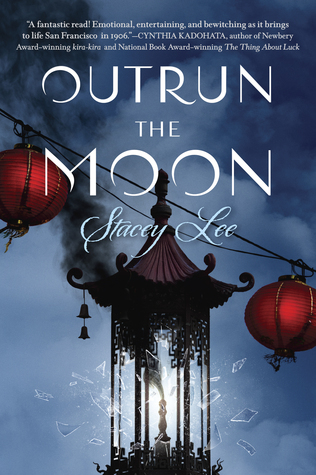 I'm so excited to be hosting today's Sunday Street Team stop for the fabulous Outrun the Moon by Stacey Lee! Don't forget to check out ReadWriteLove for information on the other stops, giveaways, and more SST fun! This is my first Stacey Lee book, and it won't be my last. Outrun the Moon is a gorgeous, gritty tapestry of San Francisco in the early 1900s, checkerboarded with ethnic ghettoes and the upper class silo of Knob Hill. It's the story of a bright, ambitious Chinese teenager, and it's the story of Chinatown, of the Chinese immigrants and their precarious balancing between their traditional culture and the pressure of American assimilation. Mercy is compelling from the start. She's fiery and vibrant but not without deference to the parents who have given her so much. Her voice is wistful, flighty, canny. She recognizes the grimness of her culture's station in American society, but hopes and fights for more. Her courage and persistence land her a spot in the prestigious whitebread St. Clare's boarding school for girls, where the fun begins. The first half of the book is very much a boarding school adventure. Mercy is pretending to be a Chinese heiress--that means faking an accent, making up some traditional ceremonies, and laughing behind her eyes while the other girls soak up her stories. It means biting her lip when the other girls sling racism at her and finding tricksy ways to get even. It also means friendship. Lee's cast is multifaceted and rich, never stooping to white saviors or one-dimensional bigots. The same girls who spew hatred at Mercy learn to respect her. The girls who grow to care for her begin by keeping their distance. Mistakes are made and some people harden their hearts; others learn. Mercy builds a camaraderie with many of the girls that is not untouched by their differences in ethnicity and status, but which slowly grows into something deeper and more lasting. It's also hysterical at times, especially Mercy's pranks and clever, subtle ways of rebellion. Then, there is act two. The earthquake. Lee vividly portrays the devastation until you can almost feel the dust and smoke in your throat. The tone seamlessly transitions from schoolgirl daydreams into brutality, tragedy, and narrow survival. Lee doesn't pull punches. There were parts that broke my heart. In the midst of this, Mercy is the beacon of strength. The same drive that got her a spot at St. Clare's keeps her on her feet when so many around her are foundering. She organizes temporary shelter, protects the other girls from the post-disaster turmoil, and through her own terror and grief, manages to bring the broken survivors together, to bring them hope. The friendships forged between Mercy and the St. Clare's girls, their intimacy and care for one another, is the best case I've seen for more focus on friendships in YA. All told, it's an uplifting and heart-wrenching book, beautifully and intricately written. Lee's attention to detail opens up new worlds for the reader and makes the past seem as vivid as the present. While historical San Francisco is fascinating, I loved the parts about Chinese culture the best. Lee portrays the 1900s immigrant experience lovingly and unflinchingly, leaving out nothing: the laundries, the fortune telling, the poverty, the seclusion, the community. Whether you're a historical fiction junkie or not, Lee's masterful story--and its striking protagonist--will trap you in its world. Outrun the Moon is a vivid tale of tragedy's ability to transcend petty divides, of friendship, and of one girl's remarkable spirit. will i read this author again? Yes yes yes, already have Painted Sky!